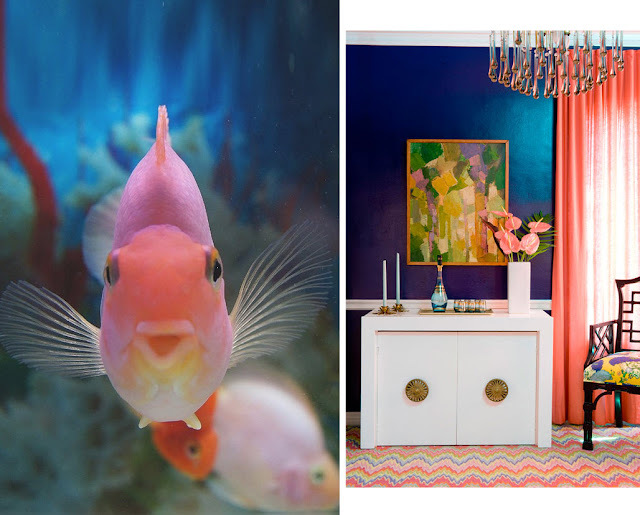 I never would have guessed that bright pink fish could work so well in a room, but it does! I love the blue walls with pink and gold accents! Fantastic philosophy! Our living room has blue and coral accents -- I love the pairing. So true. Nature is a wonderful source of color inspiration! Great sourcing! My neighbor just uses EVERY color....shhh, don't tell her it is a bit much. Oh wow, these two pair so well. Just love those colors. That's so interesting to think about! Love it.